"A320" redirects here. For the British road, see A320 road. The Airbus A320 family consists of short- to medium-range, narrow-body, commercial passenger twin-engine jet airliners manufactured by Airbus. The family includes the A318, A319, A320 and A321, as well as the ACJ business jet. The A320s are also named A320ceo (current engine option) after the introduction of the A320neo. Final assembly of the family takes place in Toulouse, France, and Hamburg, Germany. A plant in Tianjin, China, has also been producing aircraft for Chinese airlines since 2009, while a final assembly facility in Mobile, Alabama delivered its first A321 in April 2016. The aircraft family can accommodate up to 220 passengers and has a range of 3,100 to 12,000 km (1,700 to 6,500 nmi), depending on model. The first member of the A320 family—the A320—was launched in March 1984, first flew on 22 February 1987, and was first delivered in March 1988. The family was extended to include the A321 (first delivered 1994), the A319 (1996), and the A318 (2003). The A320 family pioneered the use of digital fly-by-wire flight control systems, as well as side-stick controls, in commercial aircraft. There has been a continuous improvement process since introduction. As of 31 October 2016, a total of 7,297 Airbus A320-family aircraft have been delivered, of which 6,982 are in service. In addition, another 5,494 airliners are on firm order. 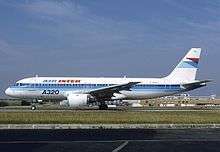 It ranked as the world's fastest-selling jet airliner family according to records from 2005 to 2007, and as the best-selling single-generation aircraft programme. The A320 family has proved popular with airlines including low-cost carriers such as EasyJet, which purchased A319s and A320s to replace its 737 fleet. As of 31 October 2016, American Airlines was the largest operator of the Airbus A320 family aircraft, operating 374 aircraft. [lower-alpha 2] The aircraft family competes directly with the 737 and has competed with the 717, 757, and the MD-80/MD-90. In December 2010, Airbus announced a new generation of the A320 family, the A320neo (new engine option). The A320neo offers new, more efficient engines, combined with airframe improvements and the addition of winglets, named Sharklets by Airbus. The aircraft will deliver fuel savings of up to 15%. As of January 2016, a total of 4,508 A320neo family aircraft had been ordered by more than 70 airlines, making it the fastest ever selling commercial aircraft. The first A320neo was delivered to Lufthansa on 20 January 2016 and it entered service on 25 January 2016. A new programme was initiated subsequently, called Joint European Transport (JET). This was set up in June 1977, and was based at the then British Aerospace (formerly Vickers) site in Weybridge, Surrey, UK. Although the members were all of Airbus' partners, they regarded the project as a separate collaboration from Airbus. This project was considered the forerunner of Airbus A320, encompassing the 130- to 188-seat market, powered by two CFM56s. It would have a cruise speed of Mach 0.84 (faster than Boeing 737). The programme was later transferred to Airbus, leading up to the creation of the Single-Aisle (SA) studies in 1980, led by former leader of JET programme, Derek Brown. The group looked at three different variants, covering the 125- to 180-seat market, called SA1, SA2 and SA3. Although unaware at the time, the consortium was producing the blueprints for the A319, A320 and A321, respectively. 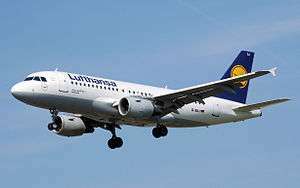 The single-aisle programme created divisions within Airbus about whether to design a shorter-range twinjet than a longer-range quadjet wanted by the West Germans, particularly Lufthansa. However, works proceeded, and the German carrier would eventually order the twinjet. In February 1981, the project was re-designated A320, with efforts focused on the former SA2. During the year, Airbus worked with Delta Air Lines on a 150-seat aircraft envisioned and required by the airline. The A320 would carry 150 passengers 1,860 nautical miles (3,440 km) using fuel from wing fuel tanks only. The Dash 200 had more fuel through the activation of centre fuel tank, increasing fuel capacity from 15,590 litres (3,429 imp gal) to 23,430 L (5,154 imp gal), enabling flights with a distance of 2,850 nmi (5,280 km). The aircraft would measure 36.04 m (118 ft 3 in) and 39.24 m (128 ft 9 in), respectively. Airbus then had to decide on a cross-section for the A320. It considered a fuselage diameter of "the Boeing 707 and 727, or do something better". It eventually settled on a wider diameter, with the internal width at 3.7 m (12 ft 2 in), compared to 3.45 m (11 ft 4 in) of the Boeing aircraft. Although heavier, this specification allowed the aircraft to compete more effectively with the 737. The A320 wing went through several stages of design, finally settling on 33.91 m (111 ft 3 in). It is long and thin, offering better aerodynamic efficiency because of the higher aspect ratio than the competition, namely the 737 and MD-80. The cockpit of the A321 is similar to that of the A318, A319 and A320. This layout would be incorporated into the A330, A340, A350 and A380. This "commonality" enables pilots to quickly transition among these aircraft. With the A320, Airbus made a controversial decision. For the first time, digital fly-by-wire (FBW) flight control system would be incorporated into a commercial airliner, although it was previously successfully proven on military fighter aircraft, such as the Vought F-8 Crusader. Aside from associated reduction in weight and cost, this system would provide flight envelope protection. The pilot, in essence, places inputs into the flight control computer, which interprets these actions and moves the flight control surfaces. FBW also allows Airbus to make flying characteristics similar to later models, such as the Airbus A330, A340, A380, and the A350. It would feature side-stick control for the first time on a commercial aircraft. Bernard Ziegler, son of the former Airbus CEO, Henri Ziegler, was the initiator of the aircraft's revolutionary fly-by-wire flight controls with side-stick cockpit controller and full glass cockpit. He successfully convinced aviation authorities of the concept's validity. During the A320 development programme, Airbus considered propfan technology, backed by Lufthansa. At the time unproven, it was essentially a fan placed outside the engine nacelle, offering speed of a turbofan at turboprops economics; eventually, Airbus stuck with turbofans. Power on the A320 would be supplied by two CFM56-5-A1s rated at 25,000 lbf (112.5 kN). It was the only available engine at launch until the IAE V2500, offered by International Aero Engines, a group composed of Rolls-Royce, Pratt & Whitney, Japanese Aero Engine Corporation, Fiat and MTU Aero Engines (MTU). The first V2500 variant, the V2500-A1, has a thrust output of 25,000 pounds-force (110 kN), hence the name, and is marginally more efficient than the CFM56, with specific fuel consumption at 0.560 lb/(lbf·h), compared to 0.591 lb/(lbf·h) of the CFM56. The horizontal stabilizer of the A320 is produced in Spain. Other A320 parts are manufactured at sites throughout Europe and the world. Production of the A320 was postponed for a number of reasons. From the start, the UK, France and West Germany wanted the responsibility of final assembly and the associated duties. These disputes were known as "work-share arguments", driven by, apart from money, prestige. The Germans requested an increased work-share of 40%, while the British wanted the major responsibilities to be swapped around to give partners production and research and development (R&D) experience. In the end, British work-share was increased from that of the two previous Airbuses, while virtually no changes took place for the other three major member-countries. Another contributing factor was launch aid, or subsidies, for the aerospace companies from their respective governments. France was willing to commit, while the Germans were more cautious. The UK government, on the other hand, was unwilling to provide funding for the tooling requested by British Aerospace (BAe). Estimated at ₤250 million, it was postponed for three years until 1 March 1984, when an announcement was made about the deal between government and manufacturer. The agreement dictates that ₤50 million would be paid whether the A320 would fly or not, while the rest would be paid as a levy on each aircraft sold. The programme was launched the following day off the back of orders for 96 aircraft from five customers. Air France was the first customer for the type, having placed an order for 50 aircraft, split evenly between firm and options, between 16 A320-100s and 34 -200s. However, British Caledonian was the first to place a firm order for seven back in October 1983. Cyprus Airways became the first to place order for V2500-powered A320s in November 1984. Pan Am also selected V2500 when it requested 16 firm orders and 34 options in January 1985, as did Inex Adria. The most significant order was to come when Northwest Airlines placed an order for 100 A320s in October 1986, later confirmed at the 1990 Farnborough Airshow, powered by CFM56 engines. An Airbus Beluga unloading A320-family aircraft parts at Finkenwerder, northern Germany. The first Airbus A320 was rolled out on 14 February 1987 amid dry ice and laser beams as part of a spectacular unveiling ceremony. A number of high-profile figures were present, including the Prince and Princess of Wales. The first flight came on 22 February, during which the aircraft flew for 3 hours 23 minutes. The flight marked the beginning of a flight test programme involving 1,200 airborne hours on 530 flights. European Joint Aviation Authorities (JAA) certification was received on 26 February 1988. 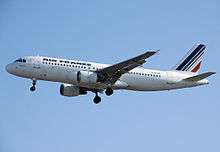 The first A320 delivery was to Air France on 26 March 1988. On 26 June 1988, a chartered Air France Airbus A320-111 (F-GFKC) crashed into trees at the end of runway at Mulhouse-Habsheim Airport. Three out of 130 passengers were killed. In February 1990 another A320, flown by Indian Airlines, crashed landed short of the airport runway in Bangalore. The ensuing fire contributed to the casualty count of ninety-two, out of 146 on board. The press and media later questioned the fly-by-wire flight control system. Subsequent investigations by commission of inquiry found "no malfunction of the aircraft or its equipment which could have contributed towards a reduction in safety or an increase in the crew's workload during the final flight phase ... the response of the engines was normal and in compliance with certification requirement" . In 2009, Airbus required about eight months to build one A320. Components from various Airbus plants are transported to the final assembly plant at Hamburg Finkenwerder for the A318/A319/A320/A321 and to Toulouse Blagnac for the A320. Nearly all assemblies are moved using Airbus' A300-600ST Beluga outsized transporters. Airbus A320s sold to Chinese airlines scheduled for delivery between 2009 and 2012 are being assembled in Tianjin, China. Airbus produces 42 A320 per month in 2015, and expects to increase to 50 per month in 2017, and possibly 60. A320 Enhanced family (or A320E family) is the working title for a series of improvements to the A320 family. The improvements include engine improvements, aerodynamic refinements – such as adding large curved winglets (Sharklets), weight savings, and a new cabin design. Despite the anticipated efficiency gains and development work, Airbus announced that the new winglets will not be offered to customers, claiming that the weight of the modifications required would negate any aerodynamic benefits. Instead, on 17 December 2008, Airbus announced it was to begin flight testing an existing blended winglet design developed by Aviation Partners Inc. as part of an A320 modernisation programme using the A320 prototype. 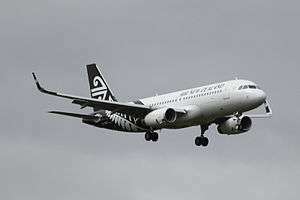 On 15 November 2009, Airbus announced future additions of Sharklets to A320s beginning in 2012 with Air New Zealand. These Airbus winglets, which are 2.4 metres (7 ft 10 in) tall and weigh 200 kilograms (440 lb), would reduce fuel burn by 4% and offer increases in payload of 500 kg (1,100 lb), or range by 110 nmi (204 km) at the original payload. This corresponds to an annual CO2 reduction of around 700 t (690 long tons) per aircraft, saving operators US$220,000 per aircraft per year. The Sharklets are to be manufactured and distributed by Korean Air Aerospace Division. Since 2007 the cabin was fitted to more than 600 aircraft as of March 2009. Airbus says it offers better luggage storage and a quieter cabin, packaged with a more modern look and feel. Additionally, improved cabin efficiency from a new galley concept, reduced weight, improved ergonomics and food hygiene, and recycling requirements. LED ambiance lighting is optionally available. Anytime LEDs are used for the Passenger Service Unit (PSU) and passengers can get information with touchscreen displays. Older A320 series aircraft can be updated. Airbus developed a new version of the A320, called A320neo, for new engine option, based on more efficient engines, at least partly in response to the threat posed by Bombardier Aerospace's development of the CSeries airliner, with which Bombardier hoped to compete directly with Boeing and Airbus for the first time. The choice for new engines include the CFM International LEAP-1A and the Pratt & Whitney PW1100G. Though the new engines will burn 16% less fuel, the actual fuel gain on an A320 installation will be slightly less, since 1–2% is typically lost upon installation on an existing aircraft. This means an additional range of 950 km (510 nmi), or 2 t (4,400 lb) of extra payload. The A320neo will also include some modifications to the wing, mainly the installation of blended winglets called "Sharklets". Airbus' CEO said to be "comfortable" with the projections of 20% lower maintenance cost for the Pratt & Whitney's PW1000G family, compared with engines powering the A320. In 2011, Airbus targeted early 2016 for the first delivery and planned to deliver 4,000 A320neo over 15 years. Virgin America became the launch customer with a firm order of 30 A320neo aircraft as a part of a 60 aircraft order on 17 January 2011. In January 2011 IndiGo reached a tentative agreement with Airbus to order 150 A320neo aircraft along with 30 more A320s. At the 2011 Paris Air Show, Airbus announced firm orders from GECAS, Scandinavian Airlines, TransAsia Airways, LAN Airlines and GoAir along with major orders from Indian low-cost carrier IndiGo for 150 aircraft and Malaysian low-cost carrier AirAsia for 200 A320neo, the largest commercial aviation order at the time. In total the A320neo received a combined 667 commitments worth US$60.9 billion. American Airlines placed an order 130 A320neo airliners on 20 July 2011. By the end of 2011, Airbus had received 1,196 firm orders for the A320neo family making it the fastest selling commercial aircraft in history. On 15 March 2013, it was reported that Turkish Airlines had placed a firm order for 82 A320 aircraft with 35 options; the firm order has 25 A321, four A320neo, and 53 A321neo airliners. The Airbus A320 family are narrow-body (single-aisle) aircraft with a retractable tricycle landing gear and are powered by two wing pylon-mounted turbofan engines. The Airbus A320 family is the only narrow-body aircraft from Airbus. The Airbus A320 family are low-wing cantilever monoplanes with a conventional tail unit with a single vertical stabilizer and rudder. Wing swept back at 25 degrees, optimised for maximum operating Mach number 0.82. Compared to other airliners of the same class, the A320 features a wider single-aisle cabin of 3.95 metres (156 in) outside diameter, compared to 148 inches (3.8 m) of the 737 and 131.6 inches (3.34 m) of the 717, and larger overhead bins. In addition, the aircraft has a cargo hold equipped with large doors to assist in expedient loading and unloading of goods. The Airbus A320 is the first narrow body airliner to have a significant amount of its structure made from composite material. Its tail assembly made almost entirely of such material by CASA, who also builds the elevators, main landing gear doors, and rear fuselage parts. The A320's flight deck is equipped with Electronic Flight Instrument System (EFIS) with side-stick controllers. At the time of the aircraft's introduction, the behaviour of the fly-by-wire system (equipped with full flight envelope protection) was a new experience for many pilots. The A320 features an Electronic Centralised Aircraft Monitor (ECAM) which gives the flight crew information about all the systems of the aircraft. With the exception of the very earliest A320s, most can be upgraded to the latest avionics standards, keeping the aircraft advanced even after two decades in service. Newer Airbus feature LCD (liquid crystal display) units in the flight deck of its A318, A319, A320, and A321 flight decks instead of the original CRT (cathode ray tube) displays. These include the main displays and the backup artificial horizon, which was an analog display prior to this. Three suppliers provide turbofan engines for the A320 series: CFM International with its CFM56, International Aero Engines, offering the V2500 and Pratt & Whitney whose PW6000 engines are only available for the A318 variant. A319 left wing with spoilers deployed during landing. S7 Airlines, Moscow-Pavlodar. Airbus has delivered 7,297 A320 series aircraft since their certification/first delivery in early 1988, with another 5,494 on firm order (as of 31 October 2016). In comparison, Boeing has shipped 9,247 737s since late 1967, with 7,741 of those deliveries since March 1988, and has a further 4,321 on firm order (as of 31 October 2016). Airbus was studying a future replacement for the A320 series, tentatively dubbed NSR, for "New Short-Range aircraft". The follow-on aircraft to replace the A320 was named A3XX. Airbus North America President Barry Eccleston states that the earliest the aircraft could be available is 2017. In January 2010, John Leahy, Airbus's chief operating officer – customers, stated that any all new single-aisle aircraft is unlikely to be constructed before 2024/2025. The baseline A320 has given rise to a family of aircraft which share a common design but with passenger capacity ranges from 100, on the A318, to 220, on the A321. They compete with the 737, 757, and 717. Because the four variants share the same flight deck, all have the same pilot type rating. Today all variants are available as corporate jets. American Airlines is the world's largest airline operator of the A320 family of aircraft with 374 airframes in service as of 31 October 2016. The A320 series has two variants, the A320-100 and A320-200. Only 21 A320-100s were produced; these aircraft, the first to be manufactured, were only delivered to Air Inter (later acquired by Air France) and British Airways (as a result of an order from British Caledonian Airways made prior to its acquisition by British Airways). Compared to the A320-100, the primary changes on A320-200 are wingtip fences and increased fuel capacity for increased range. 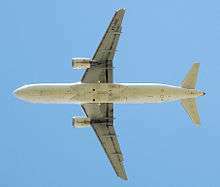 Indian Airlines used its first 31 A320-200s with double-bogie main landing gear for airfields with poor runway condition which a single-bogie main gear could not manage. Typical range with 150 passengers for the A320-200 is about 3,300 nmi (6,150 km). It is powered by two CFMI CFM56-5s or IAE V2500s with thrust ratings between 113 to 120 kN (25,400 to 27,000 lbf). The lowest speed an A320 can fly is approximately 207 km/h. A total of 4,333 of the A320ceo model have been delivered, with 354 remaining on order as of 31 October 2016. The direct Boeing competitor is the 737-800. The Airbus A321 is a stretched first derivative of the standard A320. The variant was launched in 1988, when the A320 began operations. Compared with the A320, the A321's major change is the stretched fuselage, which is lengthened by 6.94 metres (22 ft 9 in); the A321 is the largest of the A320 family. This is achieved by adding a 4.27 m (14 ft 0 in) front plug immediately forward of wing, and a 2.67 m (8 ft 9 in) rear plug. To maintain performance, double-slotted flaps were included, in addition to increasing the wing area by 4 m2 (43 sq ft), to 128 m2 (1,380 sq ft). Other minor modifications were made to accommodate the A321-100's 9,600 kg (21,200 lb) increase in maximum takeoff weight to 83,000 kg (183,000 lb). The maiden flight of the first of two prototypes came on 11 March 1993. 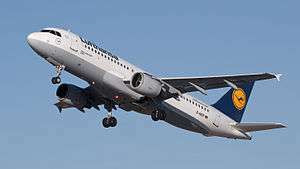 The A321-100 entered service in January 1994 with Lufthansa. The basic A321-100 features a reduction in range compared to the A320 as extra fuel tankage was not added to the initial design to compensate for the extra weight. Consequently, Airbus launched the heavier and longer range A321-200 development in 1995 which has a full-passenger transcontinental US range. This is achieved through higher thrust engines (V2533-A5 or CFM56-5B3), minor structural strengthening, and an increase in fuel capacity with the installation of one or two optional 2,990 L (790 US gal) tanks in the rear underfloor hold. The additional fuel tankage increases the total capacity of this model to 30,030 L (7,930 US gal). These modifications also increased the maximum takeoff weight of the A321-200 to 93,000 kg (205,000 lb). This variant first flew in December 1996, and entered service with Monarch Airlines in April 1997. Its direct competitors include the 757–200 and the 737-900/900ER. A total of 1,395 of the A321ceo model have been delivered, with 333 remaining on order as of 31 October 2016. The A319 was developed at the request of Steven Udvar-Hazy, the former president and CEO of ILFC according to The New York Times. The A319's launch customer, in fact, was ILFC, which had placed an order for six A319s by 1993. Anticipating further orders by Swissair and Alitalia, Airbus decided to launch the programme on 10 June 1993. Final assembly of the first A319 began on 23 March 1995 and it was first introduced with Lufthansa in July 1996. The direct Boeing competitor is the Boeing 737-700. A total of 1,457 of the A319ceo model have been delivered, with 21 remaining on order as of 31 October 2016. The aircraft seats up to 39 passengers, but may be outfitted by the customers into any configuration. Tyrolean Jet Service Mfg. GmbH & CO KG, MJET and Reliance Industries are among its users. The A319CJ competes with other ultralarge-cabin corporate jets such as the Boeing 737–700-based Boeing Business Jet (BBJ) and Embraer Lineage 1000, as well as with large-cabin and ultralong-range Gulfstream G650, Gulfstream G550 and Bombardier's Global 6000. It is powered by the same engine types as the A320. The A319CJ was used by the Escadron de Transport, d'Entraînement et de Calibration which is in charge of transportation for France's officials and also by the Flugbereitschaft of the German Air Force for transportation of Germany's officials. An ACJ serves as a presidential or official aircraft of Armenia, Azerbaijan, Brazil, Bulgaria, Czech Republic, Germany, Italy, Malaysia, Thailand, Turkey, Ukraine, and Venezuela. The Airbus A318 is the smallest member of the Airbus A320 family. The A318 carries up to 132 passengers and has a maximum range of 3,100 nmi (5,700 km; 3,600 mi). The aircraft entered service in July 2003 with Frontier Airlines, and shares a common type rating with all other Airbus A320 family variants, allowing existing A320 family pilots to fly the aircraft without the need for further training. It is the largest commercial aircraft certified by the European Aviation Safety Agency for steep approach operations, allowing flights at airports such as London City Airport. Relative to other Airbus A320 family variants, the A318 has sold in only small numbers with total orders for only 80 aircraft placed as of 31 October 2015. As of 31 October 2016, 6,950 Airbus A320-family aircraft (all variants, excluding the A320neo family) remained in commercial service with over 250 airline operators. This includes 69 A318, 1,441 A319ceo, 4,062 A320ceo, and 1,378 A321ceo aircraft. Air France, Avianca, and British Airways are the only operators to operate all four variants of the A320. For the entire A320 family, 91 aviation accidents and incidents have occurred, including 35 hull-loss accidents with a total of 1,392 fatalities as of May 2016. Fifty incidents of glass cockpit blackout had occurred as of 2012. Through 2013, the Airbus A320 family has experienced 0.14 fatal hull-loss accidents for every million takeoffs, and 0.24 total hull-loss accidents for every million takeoffs; this is one of the smallest fatality rates of any family of jets included in the study. ↑ David Learmount (3 September 1988). "A320 in service: an ordinary aeroplane". Flight International. Vol. 134 no. 4129. Reed Business Publishing. pp. 132, 133. ISSN 0015-3710. 1 2 "US Airways' final flight closes curtain on another major airline". USA Today. 16 October 2015. Retrieved 22 October 2015. 1 2 3 4 5 6 7 8 9 10 11 12 "Airbus Orders and Deliveries" (xls). Airbus. 31 October 2016. Retrieved 11 November 2016. ↑ "New Airbus aircraft list prices for 2016". airbus.com. Airbus. Retrieved 12 January 2016. ↑ "Airbus A320 (A320ceo and A320neo) Aircraft family". Airbus.com. 3 March 2013. Archived from the original on 3 March 2013. Retrieved 21 April 2013. ↑ "Mobile Amasses a Mountain of Manufacturers Archived 4 October 2016 at the Wayback Machine.," Business Alabama, June 2016. Retrieved 10 June 2016. ↑ Airbus A320 Family passes the 5,000th order mark Airbus Archived 18 December 2007 at the Wayback Machine. ↑ "Airbus steals the Paris air show". Hellocompany.org. 19 June 2007. Archived from the original on 26 July 2011. Retrieved 26 June 2011. ↑ "Spotlight on... | Airbus, a leading aircraft manufacturer". airbus. Retrieved 11 January 2016. ↑ "First A320neo delivery opens new era in commercial aviation". airbus. Retrieved 30 January 2016. ↑ "Lufthansa's First Airbus A320neo Lands in Frankfurt". Airchive. Retrieved 30 January 2016. 1 2 3 4 5 6 7 8 9 10 "A320 family". Flight International. 1997. Retrieved 17 February 2011. ↑ "Hawker Siddeley Trident". Century of Flight. Retrieved 7 January 2010. ↑ Payne, R. Stuck on the Drawing Board. Tempus, 2004. ↑ "FARNBOROUGH: Airbus's fly-by-wire pioneer Bernard Ziegler wins Flightglobal Lifetime Achievement Award". Flight Daily News. 11 July 2012. Retrieved 9 July 2013. ↑ "V2500" (PDF). International Aero Engines. Archived from the original (PDF) on 12 July 2011. Retrieved 18 February 2011. 1 2 "Timeline 40 Years of Innovation" (PDF). Airbus. Retrieved 14 December 2013. ↑ Accident description at the Aviation Safety Network. Retrieved on 19 February 2011. ↑ "Airbus baut erstmals den A320 in Hamburg". Hamburger Abendblatt (in German). 26 March 2008. Retrieved 7 June 2011. ↑ "Airbus signs framework agreement with Chinese consortium on A320 Final Assembly Line in China". Airbus. 26 October 2006. ↑ Anselmo, Joe (2 March 2015). "Analysts Flag Potential Airliner Glut". Aviation Week & Space Technology. Archived from the original on 4 March 2015. Retrieved 4 March 2015. 1 2 Moxon; Julian (17 March 1993). "A321: Taking on thee 757". Flight International. Retrieved 25 February 2011. 1 2 3 4 5 6 7 "A320 Dimensions & key data". Airbus. 1 2 3 4 "A321 Dimensions & key data". Airbus. ↑ Sebdon, Gilbert (7 February 1990). "A321 victory for West Germany". Flight International. Retrieved 24 February 2011. 1 2 3 4 Moxon, Henley (30 August 1995). "Meeting demands". Flight International. Retrieved 25 February 2011. 1 2 3 4 "A319 Dimensions & key data". Airbus. ↑ Henley, Peter. "A319 flight test". Flight International. Retrieved 26 February 2011. 1 2 3 4 5 Paul Lewis (5 November 1997). "Time out in asia". Flight International. Reed Business Information. 152 (4599): 38,39. ISSN 0015-3710. 1 2 3 4 "A318 Dimensions & key data". Airbus. ↑ "Flights that made Airbus' history". Airbus. Retrieved 1 March 2011. 1 2 3 Kingsley-Jones, Max (10–16 June 2003). "The Minibus Arrives". Flight International. Retrieved 1 March 2011. ↑ "Airbus aims to thwart Boeing's narrowbody plans with upgraded 'A320 Enhanced'". Flight International. 20 June 2006. ↑ "Avianca takes delivery of Sharklet equipped A320". Airbus. 13 February 2013. Retrieved 4 July 2013. ↑ Kingsley-Jones, Max (10 October 2006). "Airbus rethinks plan to put winglets on A320". Flight International. ↑ "Airbus undertakes Blended-Winglet evaluation on A320". Airbus. 17 December 2008. Retrieved 7 June 2011. 1 2 "Airbus launches new A320 'Sharklet' wingtips". The Australian. 16 November 2009. Retrieved 22 February 2011. ↑ "Airbus A320 to Get Sharklets Large Wingtip Devices by the End of 2012". Deagel.com. 15 November 2009. Retrieved 22 February 2011. ↑ Kingsley-Jones, Max (15 November 2009). "Dubai 09: A320's sharklets to deliver 3.5% lower fuel burn from 2012". Flight International. Retrieved 22 February 2011. ↑ "American Airlines takes delivery of its first A320 Family aircraft". ↑ Irish, John (15 November 2009). "Airbus says wingtip change to save fuel". Reuters. Retrieved 22 February 2011. ↑ "Korean Air Aerospace to manufacture new A320 Family "Sharklets"". Airbus. 31 May 2010. Retrieved 18 February 2013. ↑ Kinsgley-Jones, Max (4 February 2010). "SINGAPORE 2010: Airbus targets early A320 re-engining decision, 2015 debut". Flight International. Retrieved 7 July 2013. ↑ Stearns, Jonathan; Rothman, Andrea (1 December 2010). "Airbus to Deploy Superjumbo, Military Engineers for A320 NEO". Bloomberg. Retrieved 7 July 2013. ↑ "TAM becomes first A320neo customer in Latin America". Aviationnews.eu. 28 February 2011. Archived from the original on 20 July 2011. Retrieved 26 June 2011. ↑ "Airbus A320 Aircraft family". Airbus.com. 25 June 2011. Archived from the original on 4 July 2011. Retrieved 26 June 2011. ↑ "Virgin America Confirms Order for 60 New Aircraft" (Press release). Virginamerica.com. Retrieved 14 December 2013. ↑ Ranson, Lori (11 January 2011). "IndiGo's potential A320neo order heats up engine competition". Flightglobal. Retrieved 7 July 2013. ↑ Airbus secures 80 orders for A320NEO Archived 22 March 2013 at the Wayback Machine.. Airbus official website. ↑ Yeo, Ghim-Lay (22 June 2011). "PARIS: IndiGo firms A320 MOU". Flightglobal. Retrieved 7 July 2013. ↑ "Airbus gets biggest plane order ever to handily outpace Boeing in race to industry's top spot". Washington Post, 23 June 2011. ↑ "Airbus With New Order Record At Paris Air Show 2011". Airbus. 23 June 2011. Retrieved 17 May 2012. ↑ Kingsley-Jones, Max (15 March 2013). "Turkish unveils huge A320 family order, including 57 Neos". Flightglobal. Retrieved 4 July 2013. ↑ Section 4.2 "Failure detection and redundancy" of Briere D. and Traverse, P. (1993) "Airbus A320/A330/A340 Electrical Flight Controls: A Family of Fault-Tolerant Systems Archived 27 March 2009 at the Wayback Machine." Proc. FTCS, pp. 616–623. ↑ Sedbon, Gilbert (13 February 1988). "Keeping the Complex Simple". Flight International. pp. 44–45. Retrieved 4 July 2013. ↑ "P&W Main Website". Archived from the original on 9 June 2012. ↑ Maynard, Micheline (14 July 2008). "A New Bombardier Jet Draws Only Tepid Demand". New York Times. Retrieved 4 April 2010. ↑ "Orders and Deliveries search page". Boeing. 8 November 2016. Retrieved 11 November 2015. ↑ "737 Model Summary". Boeing. 31 October 2016. Retrieved 11 November 2016. 1 2 "Historical Orders and Deliveries 1974–2009". Airbus S.A.S. January 2010. Archived from the original (Microsoft Excel) on 23 December 2010. Retrieved 10 December 2012. ↑ "Historical Deliveries". Boeing. November 2012. Retrieved 10 December 2012. ↑ Norris, Guy (7 February 2006). "The 737 Story: Smoke and mirrors obscure 737 and Airbus A320 replacement studies". Flight International. ↑ "A30X Isn't Coming Soon". Aviation Week and Space Technology. Vol. 167 no. 18. 5 November 2007. p. 20. (registration required (help)). ↑ "Airbus sees lifespan of at least 10 years for re-engined A320". Flight International. 14 January 2010. ↑ "ICAO Document 8643". International Civil Aviation Organization. Retrieved 22 February 2011. ↑ TV channel: National Geographics. Program: Air Crash Investigation s9p3. ~30 min in. ↑ Wayne, Leslie (10 May 2007). "The Real Owner of All Those Planes". The New York Times. p. 2. Retrieved 4 March 2011. ↑ "Aircraft Families – Airbus Executive and Private Aviation – ACJ Family". Stagev4.airbus.com. Archived from the original on 3 December 2008. Retrieved 9 July 2012. ↑ "– Government of Armenia A319CJ". Airliners.net. 11 April 2010. Retrieved 9 July 2012. ↑ "Il portale dell'Aeronautica Militare – Airbus A319CJ". Archived from the original on 10 January 2015. Retrieved 26 December 2014. ↑ "ST Aerospace, Airbus and EFW to launch A320 and A321P2F conversion programme" (PDF). ST Aerospace. 17 June 2015. Archived from the original (PDF) on 18 June 2015. Retrieved 18 June 2015. ↑ Airbus A320 occurrences Archived 18 April 2016 at the Wayback Machine.. Aviation Safety, 27 September 2015. ↑ Airbus A320 hull-loss occurrences Archived 28 December 2014 at the Wayback Machine.. Aviation Safety, 27 September 2015. ↑ Airbus A320 statistics Archived 8 March 2016 at the Wayback Machine.. Aviation Safety, 27 September 2015. ↑ NTSB Accident Database search on A320 Archived 8 February 2015 at the Wayback Machine.. NTSB. Retrieved 28 September 2015. ↑ "JACDEC's Airliner Safety Statistics: Aircraft". JACDEC. 17 May 2007. ↑ Katz, Peter (21 October 2008). "Glass-Cockpit Blackout". Plane & Pilot. Retrieved 14 April 2012. ↑ NTSB Safety Recommendation A-08-53 through −55 Archived 7 March 2013 at the Wayback Machine.. NTSB, 22 July 2008. Retrieved on 14 April 2012. ↑ Air Accidents Investigation: 2/2008 G-EUOB Archived 10 March 2014 at the Wayback Machine.. Aaib.gov.uk, 22 October 2005. Retrieved on 12 January 2011. ↑ "Statistical Summary of Commercial Jet Airplane Accidents" (PDF). Boeing. 2013. p. 19. Retrieved 25 March 2015. 1 2 3 "Type Certificate Data Sheet" (PDF). EASA. 28 June 2016. ↑ "Type Certificate Data Sheet" (PDF). FAA. August 12, 2016. 1 2 3 4 "All About the Airbus A320 Family". Airbus. 2009. ↑ "High-density A320s for easyJet will retain seat pitch, assures airline". Runway Girl Network. 1 March 2016. ↑ "Airbus Studies 236-Seat A321". Aviation Week. December 10, 2012. 1 2 "Airbus Aircraft Data File". Civil Jet Aircraft Design. Elsevier. July 1999. ↑ "A320 Family Technology". Airbus. 1 2 3 "ACJ318". Airbus. 1 2 3 "ACJ319". Airbus. 1 2 3 "ACJ320". Airbus. Aris, Stephen (2002). Close to the Sun. London, UK: Aurum Press Ltd. ISBN 1-85410-830-1. Eden, Paul E. (general editor). Civil Aircraft Today. London: Amber Books, 2008. ISBN 978-1-905704-86-6. Laming, Tim and Robert Hewson (2000). Airbus A320. Zenith Imprint. ISBN 0-7603-0902-7. Payne, Richard (2004). Stuck on the Drawing Board: Unbuilt British Commercial Aircraft Since 1945. London, UK: The History Press Ltd. ISBN 0-7524-3172-2. Reed, Arthur (1992). Airbus: Europe's High Flyer. Zürich, Switzerland: Norden Publishing House. ISBN 3-907150-10-4. Wensveen, J.G. (1 January 2007). Air Transportation: A Management Perspective. Burlington, Vermont: Ashgate Publishing, 2007. ISBN 978-0-7546-7171-8. Wikimedia Commons has media related to Airbus A320 family.